$39 billion. That’s the additional amount UNESCO estimates we’ll need to spend each year if we’re to reach the fourth Sustainable Development Goal and deliver universal quality education. Unfortunately, education aid is falling. Bold steps are being proposed by the Education Commission , such as the International Finance Facility , but more is needed. We need to spend more. But above all, we need to spend more effectively. The demographic clock is ticking down and we risk losing a generation of learners. A country like India understands the fierce urgency of delivering quality education now. With 1.2 billion residents (600 million under the age of 26), India needs to create 12 million-15 million new jobs each year for the next decade, just to keep up with new entrants to the labour market. Creating and filling those jobs is impossible without quality education. India possesses strong governmental leadership, one NGO for every 400 people and a requirement that companies give 2% of their profits to charity. All of that makes a difference. To create the education system of 2030, India can’t just spend more. It must spend more effectively. Great work is underway across the world, highlighted at the annual research and policy symposium of the Center for Universal Education at the Brookings Institution (CUE). Innovation in education is happening everywhere, in diverse contexts and by diverse actors . Researchers at CUE have built a catalog of more than 2,000 innovations around the globe, from small community projects to large NGO initiatives to technology tools. However, many effective and innovative approaches operate at a small scale. While many think education has an innovation problem, it may be that it has an intelligence problem. New and promising practices fail to be taken up at scale or in policy. Tools for funding and collaboration could better support these efforts to increase their impact. The problem, in short, is spending smarter on education – investing in the effective ideas in the ecosystem – not just spending more. 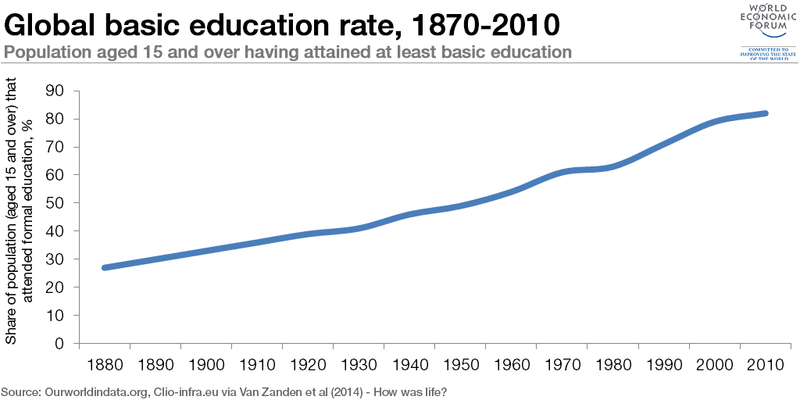 To respond to this intelligence problem, the World Economic Forum’s Global Agenda Council on Education created Matterfund , the first connective graph for education development. Born from a meeting in New Delhi with members of the Indian government, business and education community , the Council questioned whether global architecture could be created to support the scale and continued support of effective educational interventions. A connective graph makes it easier to see who supports what – which funders support which NGOs, which government players are connected to which initiatives – for people to understand an ecosystem. Promising work can rise to the surface of the graph – even if it might be small. We want to make it easier for people to find what works in education, connect, collaborate and track their impact over time. This is how we can improve education by spending smarter, not just more, on education. This will track interventions like Camfed , a rigorously-evaluated program tackling poverty in various countries in Sub-Saharan Africa through girls’ education; the Fundza Literacy Trust , delivering a “library on a phone” and creating a generation of readers and writers in South Africa; or Aflatoun , bringing financial literacy and training to 4.1 million children in 117 countries each year. Matterfund borrows inspiration from tools like Crunchbase and a connective graph opens up the opportunity to do all sorts of things that you could not do before: governments can see where momentum is in their region, international funders can have a better understanding of how to invest in a country; an initiative can identify a network of potential funders and how they relate to their peers; and an investor can see where momentum is building among trusted sources. It enables for connections to be made across the graphs so that when potential collaborations are identified, a conversation can take place. With the support of GEMS Education, Pearson and members of the Council, we started testing this concept out in South Africa , enrolling 132 organizations with 20,000 connections and $149 million represented in potential funding. A powerful test, but we need to do more to help connect education NGOs to the changing funding landscape and to help funders find quality programmes. Like in many parts of the world, an educational and social innovation movement is underway in India. One example is the Atal Innovation Mission (AIM), established by the Government of India to foster an ecosystem of innovation. To create the innovation ecosystem, India will need leadership at all levels. It will also need new tools to collaborate, scale and encourage effective giving. Matterfund can help.